Booking Mama: Happy 75th Anniversary Penguin & Giveaway! 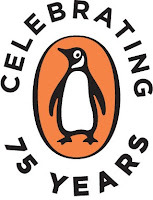 Today, July 30th marks the official 75th anniversary date for the launch of Penguin Books, and Penguin is going all out to celebrate this summer. A bright-orange Penguin Mobile (an adorable mini-cooper with the Penguin logo) is driving to bookstores all over the US to bring some of our bestselling authors to parties in their hometowns, increase awareness of The Nature Conservancy, and promote literacy -- I was lucky enough to see it at BEA last May. At each event, a set of 75 Penguin Books is donated to a local library or literacy group. Each author is signing the Penguin-mobile as it makes its way across the United States, and the summer’s events will culminate with a party at the New York Public Library in September where Penguin will auction the car with the proceeds going to the New York Public Library. Penguin is also donating sets of books to numerous U.S. military bases in Iraq and Afghanistan. Penguin imprint alone has over 4000 books in print. To learn more about their history, see here and here. Giveaway alert: Penguin has graciously offered to send me two terrific books, and I want to share one of them with you. Here's my issue -- I can't decide which book to keep and which book to share so I'm asking for your help. Just leave a comment telling me which book you'd prefer along with your email address; and if your name is picked, then you win the book of your choice! This contest will be open until August 12th at 11:59 p.m. ET, and I will notify the winner the following day. Open to those of you with U.S. and Canada mailing addresses only. Good luck! Summary: When it was published in 1995, Mary Karr’s The Liars’ Club took the world by storm and raised the art of the memoir to an entirely new level, as well as bringing about a dramatic revival of the form. Karr’s comic childhood in an east Texas oil town brings us characters as darkly hilarious as any of J. D. Salinger’s—a hard-drinking daddy, a sister who can talk down the sheriff at twelve, and an oft-married mother whose accumulated secrets threaten to destroy them all. Now with a new introduction that discusses her memoir’s impact on her family, this unsentimental and profoundly moving account of an apocalyptic childhood is as “funny, lively, and un-put-downable” (USA Today) today as it ever was. Summary: In the sweeping tradition of The English Patient, Janice Y.K. Lee's debut novel is a tale of love and betrayal set in war-torn Hong Kong. In 1942, Englishman Will Truesdale falls headlong into a passionate relationship with Trudy Liang, a beautiful Eurasian socialite. But their affair is soon threatened by the invasion of the Japanese as World War II overwhelms their part of the world. Ten years later, Claire Pendleton comes to Hong Kong to work as a piano teacher and also begins a fateful affair. As the threads of this spellbinding novel intertwine, impossible choices emerge-between love and safety, courage and survival, the present, and above all, the past. I would love to read "The Piano Teacher" because the synopsis of this book is intriguing and one that I would choose of the two. Thank you so much for hosting this giveaway. I don't usually read memoirs,but The Liar's Club sounds entertaining. Shoot! I have them both, so please don't enter me. What a tough decision. I read The Liar's Club...wow 7 years ago. It's amazing. You should read it! Like now. It's the perfect time because her new book Lit is coming out soon and I believe it's a continuation of the first two memoirs that she wrote. Would love to win the other The Piano Teacher since I've already read the first book (and actually own it as well). I love Penguin books. I enjoy seeing the little orage logo on the spine. I bet the Penguin Mini is adorable. I'd love to read The Piano Teacher. I would love to read The Piano Teacher. The synopsis sounds interesting, and I love the beautiful cover. Thanks for the giveaway. Please enter me for The Piano Teacher. I would love to be entered for The Piano Teacher! Thanks! I would love to read the Piano Teacher - it has been on my wishlist forever! Definitely The Piano Teacher for me. I can't throw my name in for this one because I've read The Liar's Club (LOVED it) and have The Piano Teacher on my shelves. I think this is what we would call a no-risk proposition! Please enter me for The Liar's Club. Unless that's the one you'd rather read! hahaha tough decision! I'd choose The Liar's Club. It sounds like a fun memoir, and I haven't heard of it before this. I've had my eyes on The Piano Teacher for some time now...so that's my pick! I would choose The Piano Teacher. I have heard good things about it. Our book club has already read a few books about WWII (Guernsey & Hotel on Bitter Sweet) so I'm sure they will love 'The Liars Club'...please enter me. I'd like to be entered in your Penguin anniversary giveaway, and would love to read "The Piano Teacher". Love the cover for it. I read and enjoyed "The Liar's Club" awhile back. Thank you! I'd love to read The Liar's Club. I would love to read "The Piano Teacher". I would love the opportunity to read Piano Teacher. It is a possible selection for our book club and I am interested in previewing it. Thank you. I think I have to go with The Liar's Club. WordLily AT gmail DOT com. I would love to read The Piano Teacher. Thank you for including me. I would like to be entered for the Liar's Club please. Thank you. I would like the Piano Teacher. The Piano Teacher sounds like my kind of story. It gets my vote. The Piano Teacher looks good! I would choose the Piano Teacher. The storyline and the setting both make the book sound appealing. I'd love The Liar's Club! Please count me in. Thank you! I would love to read The Piano Teacher :) *Thanks* for the giveaway! No need to enter me -- I just posted this at win a book for you. I would love to win Mary Karr’s memoir, THE LIAR'S CLUB ~ what a unique and quirky sounding family. I would love to read The Piano Teacher. Thanks for hosting this giveaway! I would love to read The Liar's Club! I've already read The Piano Teacher and really enjoyed it! I'd love to win The Liar's Club! Thanks, and thanks to Penguin! I would love to read THE PIANO TEACHER because a tale of betrayal sounds much more exciting to me than one that is funny. I'd love The Liar's Club. I'd love to read The Piano Teacher. Thanks for the giveaway. I would love to win The Liar's Club. It sounds really good! I would love to win "The Liars Club" Thanks for the chance! I would love to read The Piano Teacher. Thanks so much for the giveaway! I'd choose "The Piano Teacher". Thanks for the giveaway!